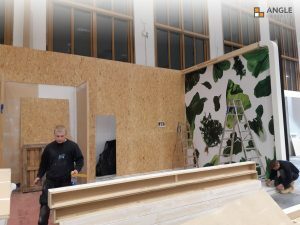 Fruit Logistica 2019 - Messe Berlin | Angle Exhibits - Desing, build, install, Stands, Retail, Events, Europe. 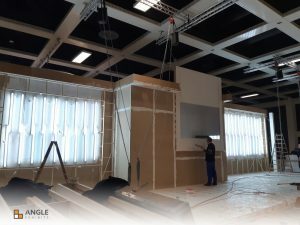 Angle Exhibits - Desing, build, install, Stands, Retail, Events, Europe. 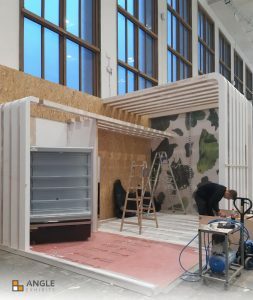 Design, build and install of stands, retail, events Europe. At the beginning of February, the Fruit Logistica event takes place in Messe Berlin from Wednesday, February 6 to Friday, February 8, 2019. At Angle Exhibits, we attended the assembly of several stands at this event, where 3,239 exhibitors and 78,000 visitors come every year. 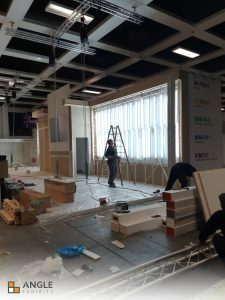 This year we assembled 3 stands, the 3 have been designed by our team, manufactured in our facilities and then moved to Messe Berlin for later assembly. Once again we have made the necessary arrangements with the site to carry out the assemblies without problem and thus facilitating the work to our end customers. At the moment we can show some images of the assembly, hoping to have the final result shortly. Angle Exhibits can provide architects, designers and the management team needed to achieve their goals.